Pallet Racks are material handling storage solutions designed to store materials on pallets (also known as skids), typically within a warehouse setting. There are many varieties of pallet racking, which all have horizontal rows with multiple shelf levels. 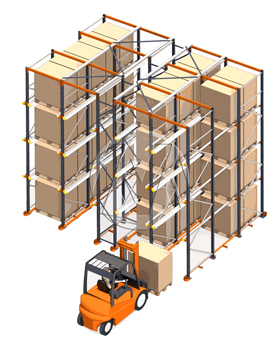 Different systems of pallet racks include: drive-in, drive-thru, flow, and push-back. About Manufacturer: Mecalux (Interlake) is among the leading companies in the storage systems market specializing in the design, manufacturing, sale and services of steel racking, warehouse automation, warehouse management software and other storage solutions. Mecalux is the leading storage company in Spain and ranks third in the world in its field, selling throughout more than 70 countries.